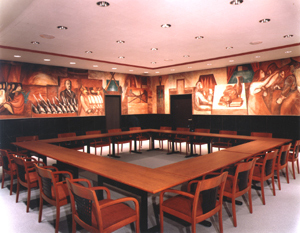 Of the original artworks still existing in Josef Urban's New School building of 1931, the Orozco Murals are the most celebrated. New finishes, lighting, and climate control systems provide an appropriate environment for these irreplaceable fresco paintings. 1996 New York Landmarks Conservancy Lucy G. Moses Preservation Award.